Our story. Washed like our food, like our hair. We both get prepared on Sunday. My mother hollers as I slip conformity onto my tongue to fit in. Playgrounds are hard on proper tongues. Tongues that are molded, scraping the black off them, now there’s a white cover. A film that my mother’s deep brown skin couldn’t show off. Birthing a pale tongue that she could raise to sound like other. Life isn’t so hard when you are other. Yet she gives me a name that sticks out. A finger risen from her blood. My name and tongue have been at war. It begs for dialect for a drawl, my name. While my tongue has been whipped into perfect salute. My mother’s mantra as if that will help us out the projects, out the hood, out the welfare. That is not a proper sentence. Projects, hood, and welfare do not fit in polished America. It ain’t lady like either. Correct yourself. My womanhood will be less valid without pronunciation. Slang was banned from our house. Every day I walked through the courtyard of section 8 with my spine tall with the alignment of other, but here. Without losing your heritage. Tongue a tool, a weapon, and the only thing that a mother could gift her black child that would walk amongst bodies. Name unable to assimilate, so why would the tongue. It could shock oppressors while uniting tha ghetto. A contradiction of the mouth. Sahara is an Author, Director, Actor, Poet and Visual Artist with a BA of Fine Arts in Communication: Theatre Studies and a specialization in Art Therapy. She was born in Knoxville, TN. While being raised there and in Baltimore, MD she discovered a passion for writing and the stage. 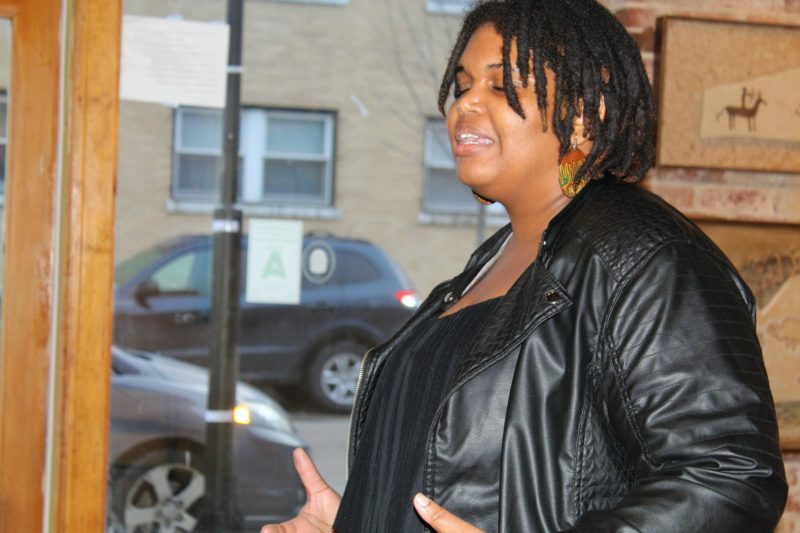 In St. Louis she is a member of the UrbArts Collective, working as an educator and writer. For three consecutive years, Sahara was member of the nationally ranked St. Louis poetry slam team until 2018. She placed in the top 20 at the Woman of the World Poetry Slam in 2017.